Michael Majors is a former professional Magic player and content producer who now works as a contractor on the Play Design team within R&D. With the rotation of Glorybringer from Standard, there's been a short gap without a hard-hitting hasty Dragon. While the guilds of Guilds of Ravnica were unable to deliver, the Gruul in Ravnica Allegiance have plenty to offer. 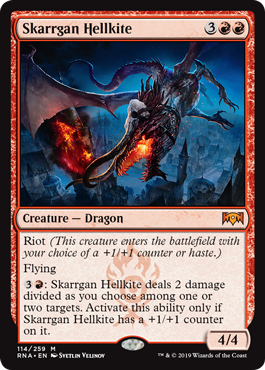 While it's true that Skarrgan Hellkite doesn't naturally have the keyword haste, Gruul's new keyword riot means that the Dragon's floor is a 4/4 flying haste creature. This is a stat line that has been a star of Standard multiple times, including the previously mentioned Glorybringer and Stormbreath Dragon. Riot is a relatively simple mechanic on the surface. Am I interested in getting paid now with some burst damage from haste or waiting for the larger battlefield impact that comes from the +1/+1 counter? However, we know that much of the complexity of Magic comes from context, and there's often a lot to think about on this seemingly simple card. Skarrgan Hellkite pays you for waiting a turn to deal damage by not only becoming larger, but also granting a powerful mana sink ability to dominate the battlefield of small creatures. The Hellkite's "Chandra's Pyrohelix" ability is excellent for clearing chump blockers and getting the powerful mythic through for damage. Hellkite's activation also provides some interesting combat math decisions. Three turns of the Dragon's hasted attacks are worth 12 damage uncontested, but with the combination of a +1/+1 counter and an ability activation over two turns, the Hellkite's output can be 14. Ultimately, Skarrgan Hellkite pairs both flexibility and power into a single package. Do I want to assassinate my opponent's planeswalker while they're tapped out or contain their battlefield over the rest of the game? Am I willing to risk my opponent having a removal spell to gain a larger battlefield presence instead of dealing damage now? What do my next turns look like? Am I going to keep playing powerful riot threats or will I have the mana to invest into my Dragon? In the past, similar Dragon designs have often just prompted players to get their immediate value when they can get an opportunity and move on, but Skarrgan Hellkite asks you to weigh that immediate value against the potential of the future. Where can Skarrgan Hellkite go? Large hasted Dragons have proven time and time again to be excellent curve toppers in aggressive decks as well as centerpieces of midrange strategies. Skarrgan Hellkite is excellent mana flood protection for both types of strategies. Even further, Skarrgan Hellkite's ability might even make itself into a centerpiece of a ramp strategy. Skarrgan Hellkite has got a little bit for everyone. Just want to smash your opponent with a giant haste flier? Need a gigantic monster to rule the battlefield? Interested in some strategic complexity and the choice to tie it all together? Skarrgan Hellkite is the new Dragon for you.